With record-breaking speeds for fiber-optic data transmission, University of Illinois engineers have paved a fast lane on the information superhighway—creating on-ramps for big data in the process. Graduate researcher Michael Liu will present the research team's developments in oxide-VCSEL technology, which underpins fiber-optic communications systems, at the Optical Fiber Communication Conference and Exposition today in Anaheim, California. The research team was led by electrical and computer engineering professor Milton Feng—who will be in attendance at the conference—and also included professor emeritus Nick Holonyak Jr. and graduate researcher Curtis Wang. "Our big question has always been, how do you make information transmit faster?" Feng said. "There is a lot of data out there, but if your data transmission is not fast enough, you cannot use data that's been collected; you cannot use upcoming technologies that use large data streams, like virtual reality. The direction toward fiber-optic communication is going to increase because there's a higher speed data rate, especially over distance." 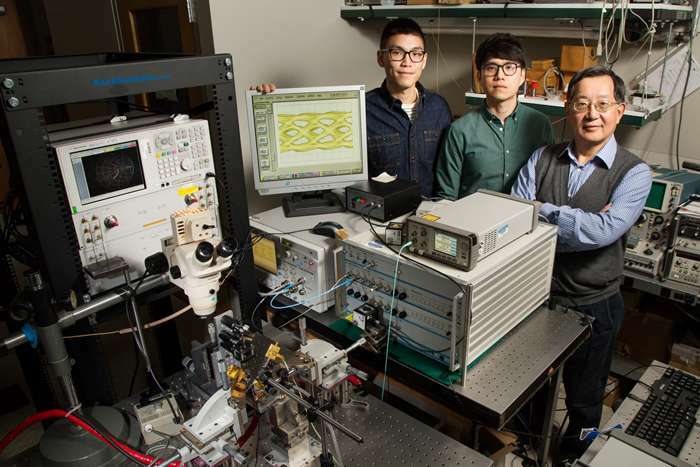 Feng's group has been pushing VCSEL technology to higher speeds in recent years, and in 2014 was the first group in the U.S. to achieve error-free data transmission at 40 gigabits per second (denoted as Gbps). Now, in a series of conference papers, they report 57 Gbps error-free data transmission at room temperature, as well as 50 Gbps speeds at higher temperatures up to 85 degrees Celsius (185 degrees Fahrenheit). "That's why data centers are refrigerated and have cooling systems," Feng said. "For data centers and for commercial use, you'd like a device not to carry a refrigerator. The device needs to be operational from room temperature all the way up to 85 degrees without spending energy and resources on cooling." Feng hopes that the conference presentations and papers will prove that high-speed operation at high temperatures is scientifically possible and useful for commercial applications. "This type of technology is going to be used not only for data centers, but also for airborne, lightweight communications, like in airplanes, because the fiber-optic wires are much lighter than copper wire," Feng said. "We believe this could be very useful for industry. That's what makes the work so important to us."